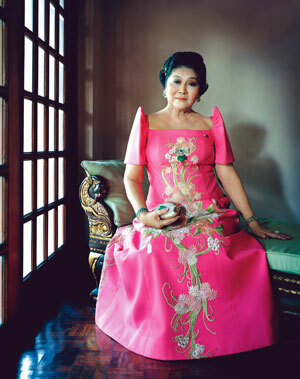 But I forgot about Imelda Marcos! 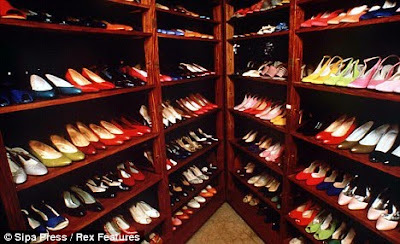 If you think Mariah's shoes closet is massive then you should think twice. 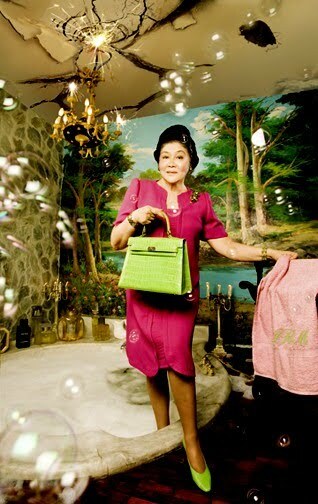 Imelda Marcos's shoes collection is far more than massive. 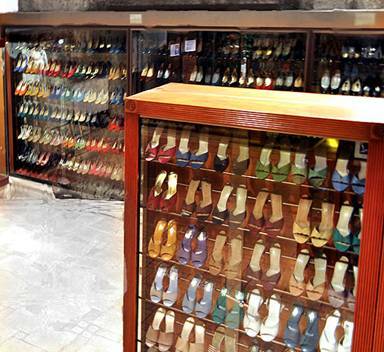 Imelda's shoes collection could fit a small house! 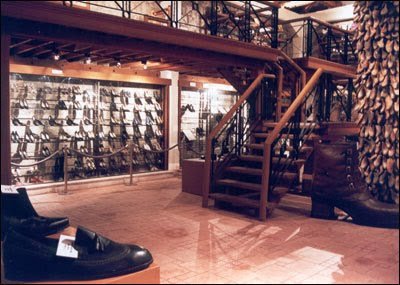 In fact, her museum is a small building in which she housed her shoes collection in every room. Imelda opened a museum to house her MASSIVE shoes collection, located in Manila, the capital of the Philippines. Her collection is said to have reached to 3000 pairs (GASP!) but only around (at least) eight hundred pairs of the collection are being housed in the museum. Among the most expensive in her collections are Ferragamo, Chanel, Christian Dior, Givenchy, etc. 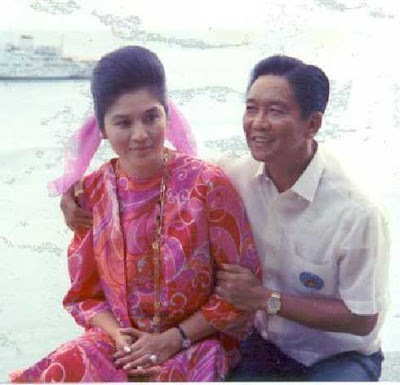 Who doesn't know Imelda Marcos? 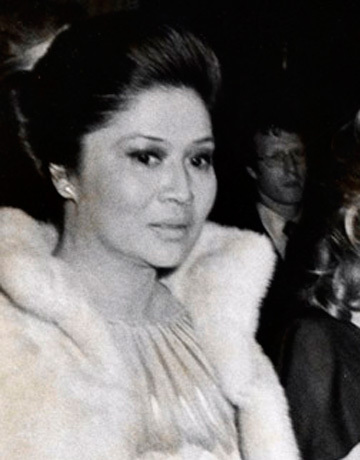 Her lavish lifestyle when she was the wife of the Phillipines president Ferdinand Marcos made her famous. Their government were said to be the most corrupted until the poeple power bring them down and their family fled the country. 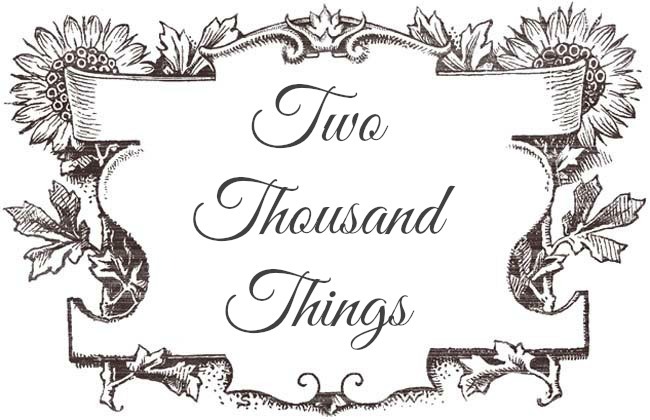 When she left the country it was said that she left around 800 dresses, some mink coats and 3000 pairs of shoes in her palace! I googled her and found out that she actually a very pretty lady especially in her youth. She is sophisticated and ladylike, pretty and well-poised, such a perfect first lady if not for her bad rep as a big spender. 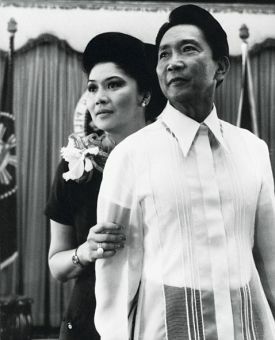 She also was very fashionable, probably the most stylish among the few of well-dressed first lady such as the famous Jackie O, Michelle Obama, Akie Abe (i'll post about Japan's first lady Akie Abe in another time), etc..
With her husband Ferdinand Marcos. Look how sophisticated she is.. If you wanna see more of my Celebs Style (well, Imelda is a celeb in the shoe-crazy world ;p), click here to see other celebrities personal style. I about fell over when I read this and saw the most fabulous closet on the planet!!! Thanks for the post because I had never heard of her, proving you learn something new everyday! 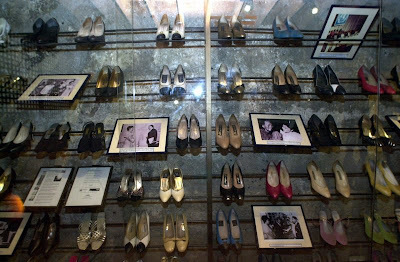 I agree with you that she is stylish and she really have a shoes museum, she also have a collection of beautiful jewelry and clothes. my mom and all my other relatives have always talked about her shoe collection :P she's a shoe idol! How can someone have 3,000 pairs of shoes? I'd LOVE to, but there is no way you could wear each pair. And don't we all have several pairs of shoes that sit in our closet unworn because we have our favorites? I know I do! id die for a shoe rack like that ! 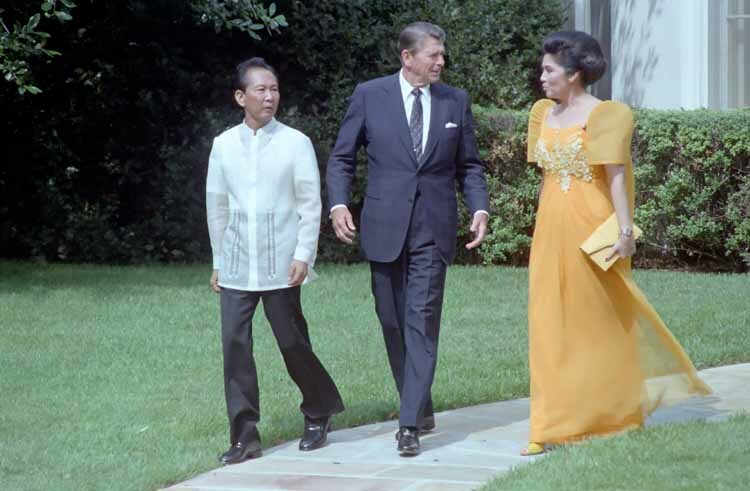 You do realize that Imelda Marcos was a horrible person. 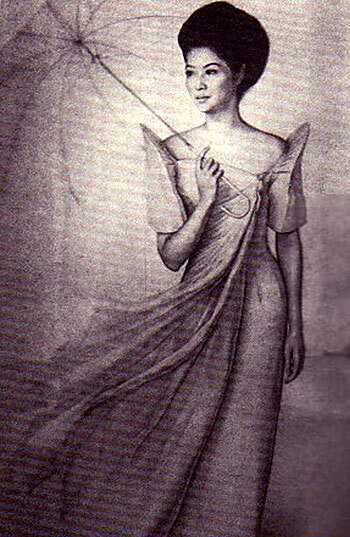 She used public funds to buy her elaborate lifestyle and while she had 3,000 pairs of shoes and prided herself on never wearing the same outfit twice, her people were suffering under her husband's militant rule and building her a palace made of coconut shells so she could host the likes of Brook Shields. 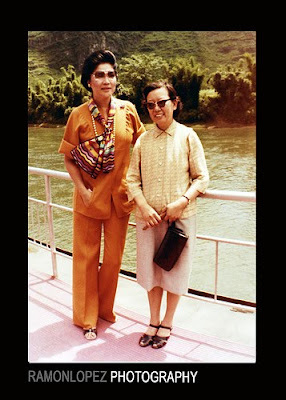 @Anonymous: If you read my post I do realize the facts you mentioned and I wrote that Imelda and her husband are corrupt leaders that eventually fled the country due to people's power, but since this is a fashion blog so my highlight was on the shoes collection that she has (and the fact that she's also famous for that) and about the museum which houses her shoes collection. 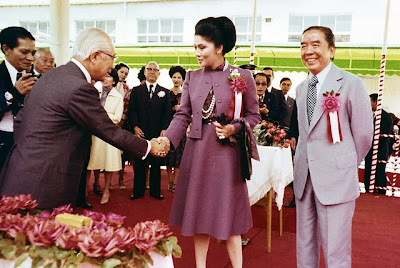 For the political judgment on Imelda..well, let's just say..this is not the right part to discuss it since this is not a political blog ^o^ Let's just stay on the fun fact now, shall we? 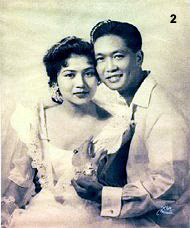 There was a New York shoe shop poster saying: "There is a little Imelda in all of us." Yes, I was fascinated to realize she was quite pretty when she was young, also. 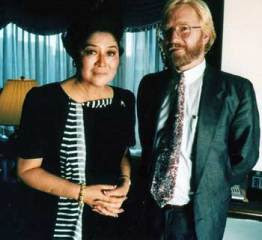 She has a bad reputation, but a powerful woman who looked good. 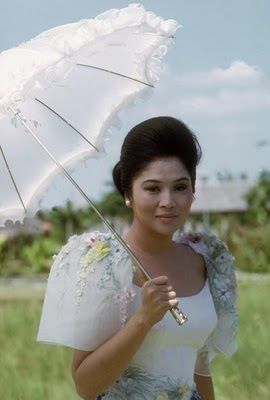 'THE' one and only, Imeldific Imelda of the PHILIPPINES. Loves it! But thank you for this post!!! A lot of people in the Philippines criticize Imelda but the truth is she did a lot of good things in the country (a lot of people didn't know that). Anyway, that's the past and we're not talking politics here. I love Imelda's style - especially like the one on your photo where she wore that old rose (I may be color blind)dress on her visit to Japan. I met her twice and she's really gracious and honest on her opinions - especially when it comes to fashion. 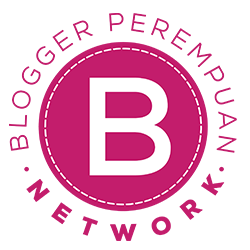 She's a typical fashionable lady and women will really like her if they get to know her. I was blown away by your article regarding Imelda Marcos coming from a non-Filipino like you. It's true she and her family might have a bad rep until now in our country, but one thing is for sure you cannot hide her love for fashion. 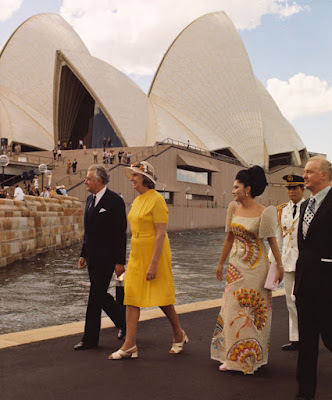 Yes, she's one of the fashionable First Ladies and I adore her for that. The "pointy shoulder" is actually the sleeve design for the national costume called "tern", which Imelda Marcos liked to wear. i came here bcoz of mariah shoe collection. its pretty amazing. i learned new things today. 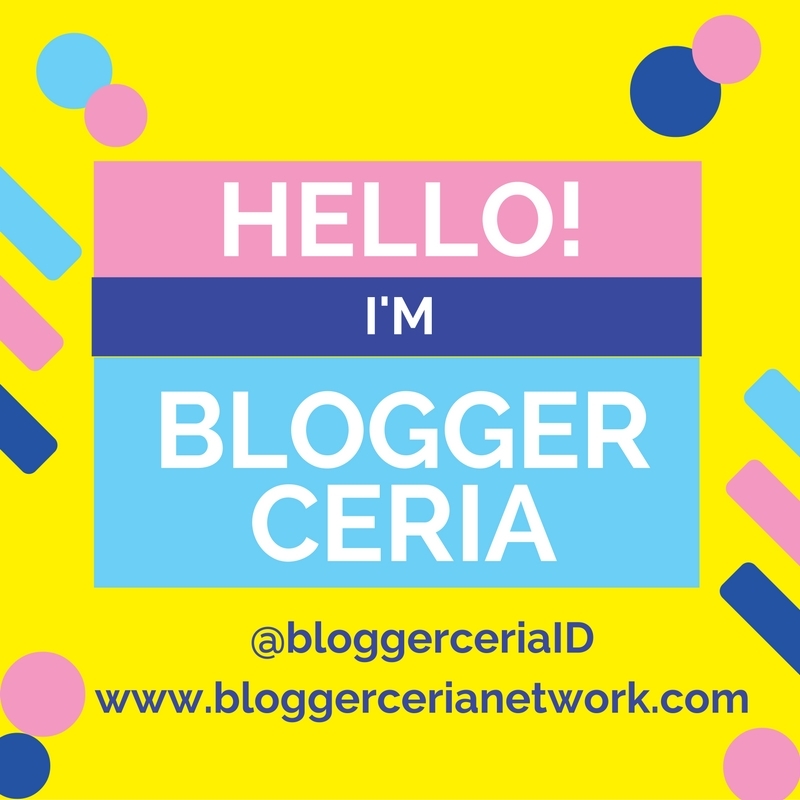 thanks for the blogger.